Dr. Christine A. Sinsky is this year’s speaker at the Ellen Hughes Lectureship - Herbst Hall - June 6, 2019 - noon to 1pm. Dr. Sinsky's talk, Creating a Manageable Cockpit for Clinicians: A Shared Responsibility will discuss the science supporting the quality, safety and business cases for focusing on creating a manageable cockpit for clinicians. 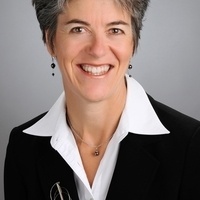 Dr. Ellen Hughes, full Professor of Medicine, first Director for Education, Interim Director of the Osher Center (1997-2001), founding member of the Academy of Medical Educators and Advisory College Mentor in the School of Medicine at UCSF. Please contact Cecilia.populus-eudave@ucsf.edu to RSVP.